If you’re like me, your life revolves around the receiving and sending of information through the Internet. I tend to be a one stop shopper. With Google providing space for my blogs, as well as applications that allow me to see how traffic to my blogs is progressing daily, it just makes sense that I keep all of my correspondence under the same umbrella. With Microsoft Window’s ability to flip back and forth between multiple screens, I always have my Gmail inbox open on one screen. The icon at the bottom of my computer screen indicates whenever new emails arrive, allowing me to continue working on other matters while I’m waiting for an e-mail response on a different project. With Gmail, you can set up filters to automatically send annoying spam (email from people you aren’t interested in hearing from again) straight to the trash bin. Plus, Gmail’s servers catch most random spam emails before you even see them, and they go straight to your trash bin too. This helps greatly in keeping your inbox organized! A problem I’ve experienced with other email systems is when it comes time to reply, you go to a blank entry screen with no view of the message you’re responding to. But with Gmail, the original message remains on screen so you can scroll down and re-check information if needed while you’re writing your reply. Comparing Gmail with Outlook and Outlook Express, there are some differences in how they do searches and handle files. With Gmail you create labels instead of folders (which is what Outlook uses). You can attach multiple labels to a document in Gmail, allowing access from numerous directions. Whereas, Outlook requires you to go to that one specific folder to access your document. Check out Lifehacker’s detailed comparison between Gmail and Outlook. Outlook is a software package that is stored on your computer. Gmail is an Internet-based system that requires no software to be stored on your computer. Beyond taking up space on your hard drive, what does this mean? If you work from numerous computers, or if you need to access your e-mail from someone else’s computer, you can gain access to your Gmail account instantly; simply go to Google.com and sign in. Your home page will come on screen and it’s like you’re working from your own computer — no matter where you are! When you’re done, and you return to your own computer, everything will be right where you expected it to be. See why TechCrunch has Gmail coming out on top (compared to Yahoo and Hotmail) when it comes to speed. They also note that Gmail offers more storage space, and best of all it’s free. 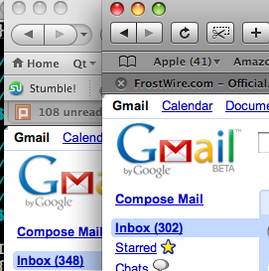 Admittedly, I signed on with Google’s Gmail quite some time ago. It has served me well and I like the one stop shopping aspect of Google. From what information I find on the subject, it appears I’m hardly alone in my thinking. If you’re interested in finding out how Gmail works check out this video that gives an overview on how to use Gmail to write emails. Once you see how versatile and user-friendly Gmail is, you’ll be signing up for your own Gmail account (…if you haven’t already). Google: In Your Own Words – Why Do You Use Gmail? Askville: What’s The Best Email System?